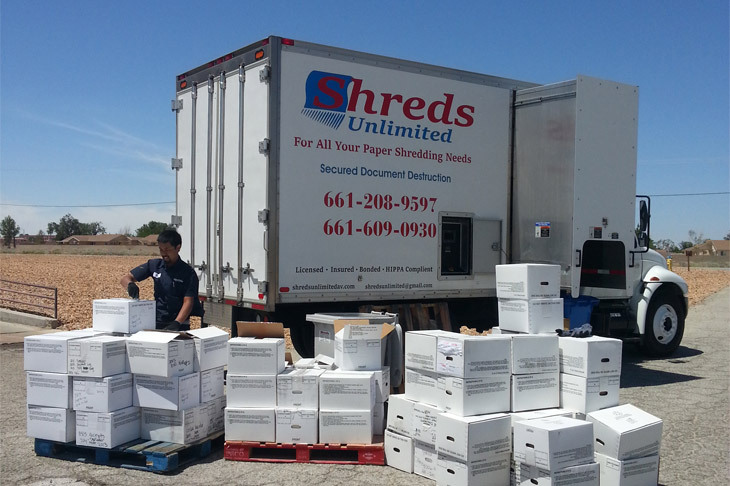 For off-site shredding services, Shreds Unlimited can come to your business and collect your documents. We empty your consoles into large locked bins or switch out large full bins for empty bins. We then securely transport all documents in locked containers to our shredding facility until they are emptied into our shredder to be destroyed. 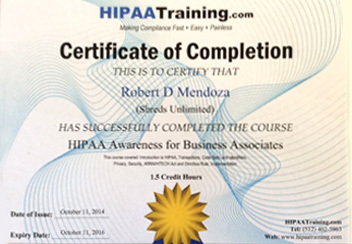 Our bonded and screened employees never handle your confidential material. Our off-site shredding services can be performed on a regularly scheduled basis or as a one-time purge. Our off-site services also include bulk pick-ups of boxed material at your business, residence or storage facility. We will transport all boxes in a locked box truck back to our facility and shred all material same day. After your documents are destroyed, we provide you with a certificate of destruction for your records. All shredded material is transported to the nearest recycling center where 100% of all shredded material is recycled.